Reader's Choice Awards - link fixed! We are so excited to be in the Creating Keepsakes Reader's Choice Awards as a nominee in a couple of categories! This is our first time as a nominee and we want you to vote! If you feel that we are worthy of this distinction please vote for us. You can vote here. Good luck to everyone and thanks to CK for including us this year! Check out this cool townhouse all decked out for the Fall. This townhouse is one of our 3 houses we released. All the houses are preassembled and ready for you to use! They also each come with a mini album inside for you to record your memories PLUS the pieces to do all the windows and doors too! How cute is that? Do you also recognize our Scallop Ric Rac that forms the roof? How cool is that? 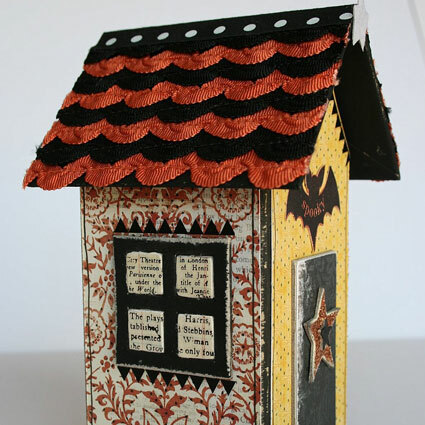 Related to this, check out this little cute Halloween hanging made from a page of our Scallop Ring Book plus one of our Girl Chipboard Album pages. 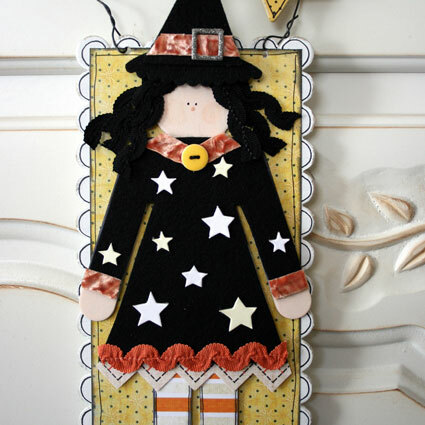 Do you see some of our ribbons and trims used as hair and accents for this sassy little witch? 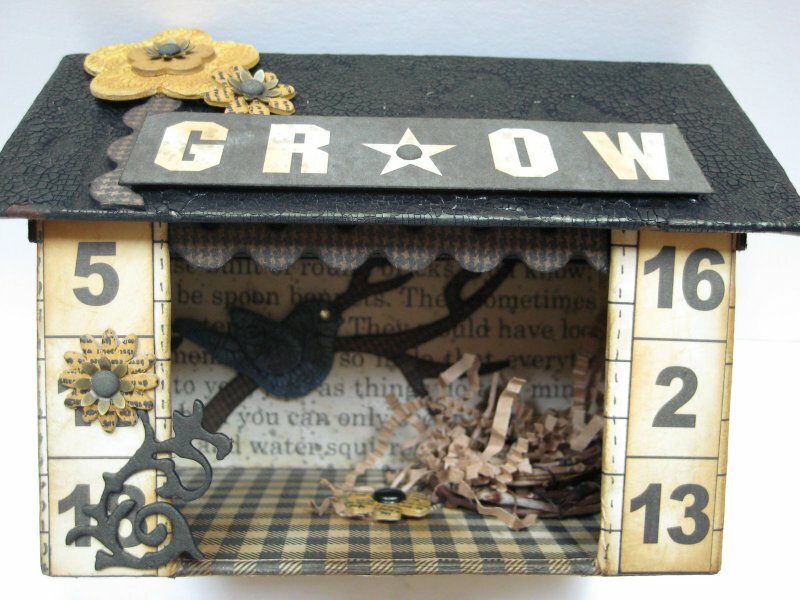 You will find some designer tips for these 2 projects (and more) on our Creative Corner so be sure to check it out! 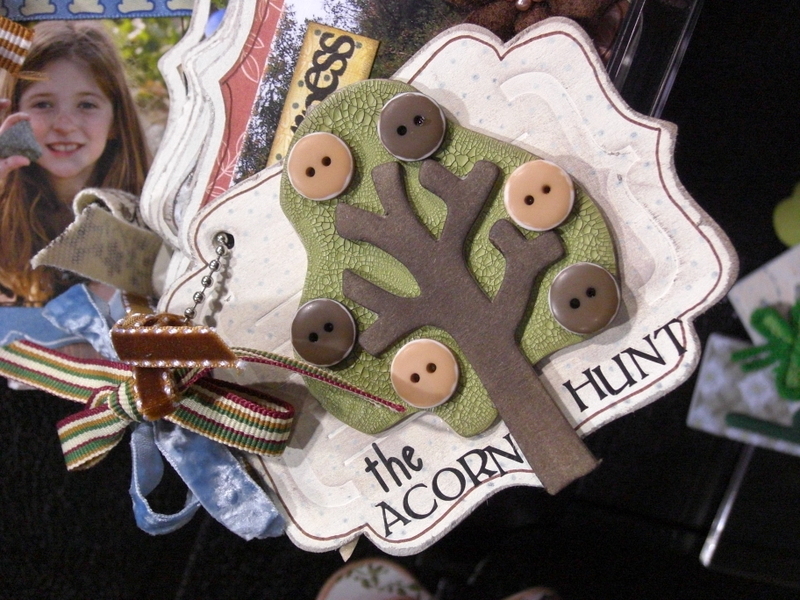 lyWe wanted to thank everyone who has stopped by the blog and also our booth to check out all the goodies we had. Remember, tomorrow is the big day of announcing the sneak peek week winners; we wanted to share with you some photographs from the booth in the mean time. Can you see all the eye candy here? Our design team really did an amazing job with showing how our products can open a world of possibilities. 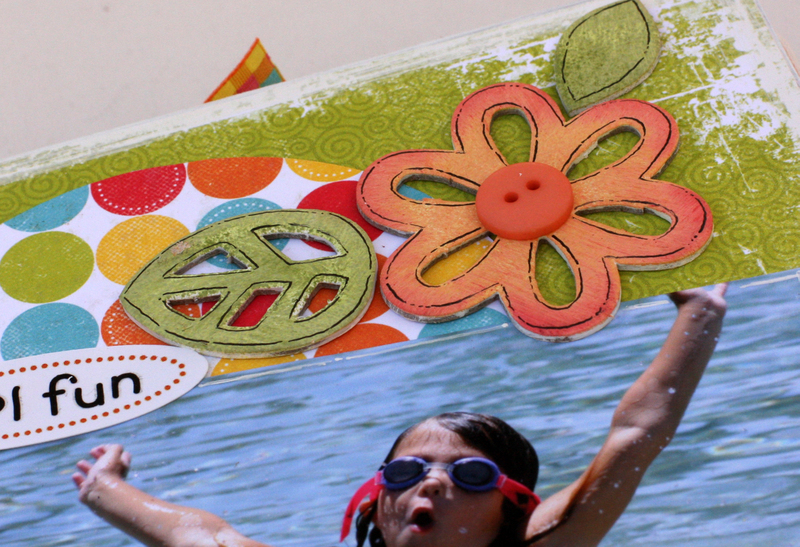 How about our new large windows chipboard tab album? 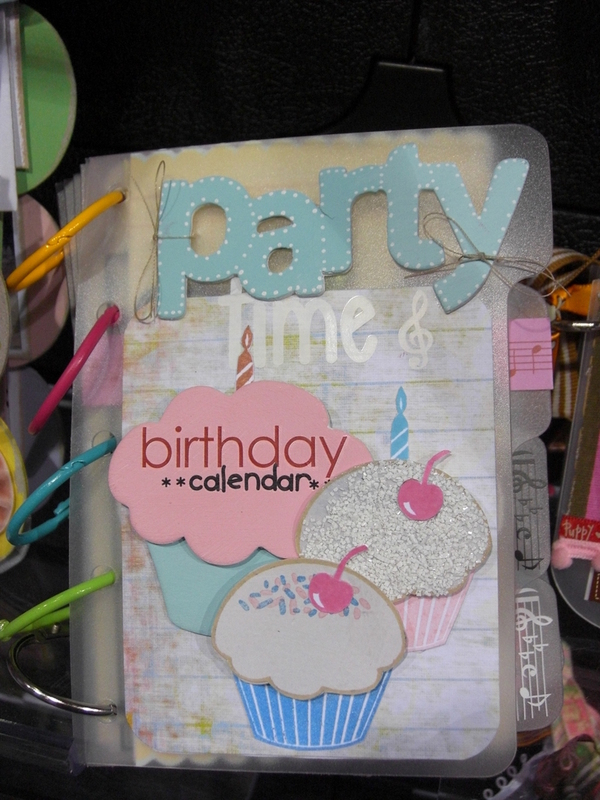 And finally what about a brillant party cupcake book? With that, we leave you with sweet dreams and we will announce the winners tomorrow (evening)! 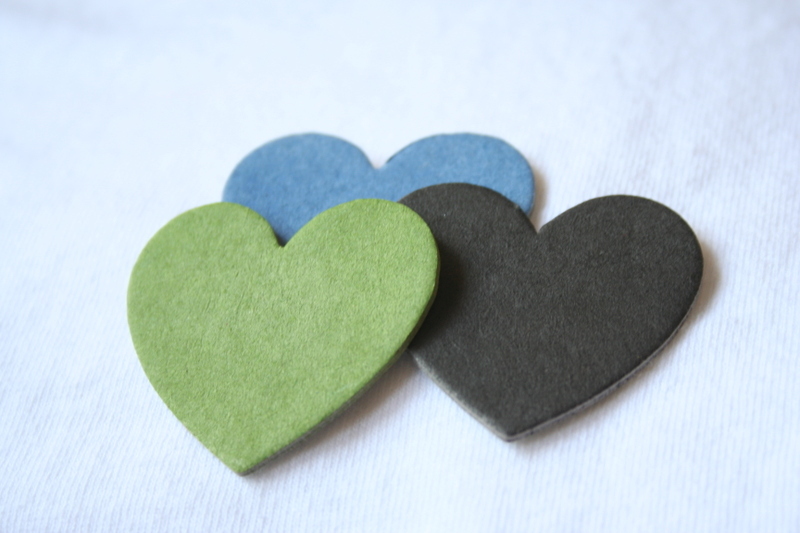 we are off to chicago - if you are going to be at CHA-S please stop by our booth for some make and takes (different ones each day) and lots of eye candy! for those of you who can't join us, check out all the goodies of our CHA-S Catalog here. 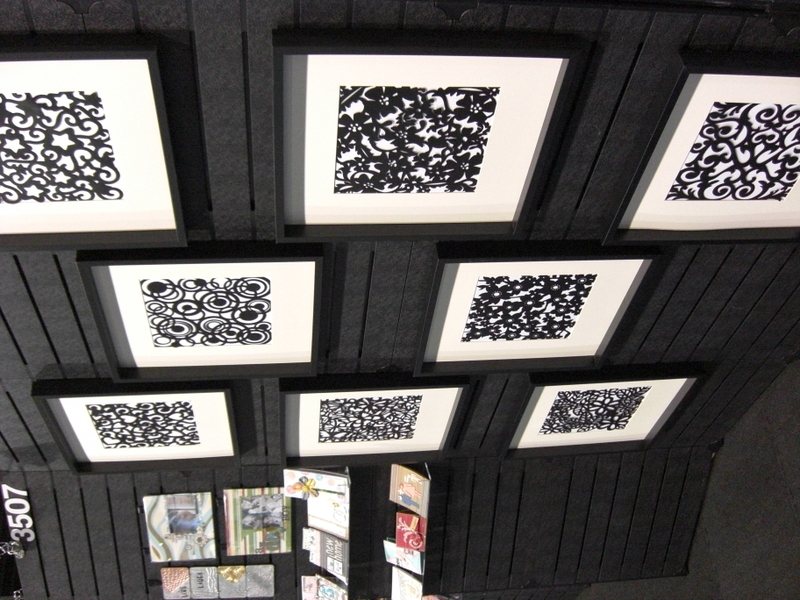 if we find we have enough time and are techo-savvy enough, we will try to post some video of our booth at CHA so you can have a virtual visit when we get back! Ok so we wanted to say that we can't help ourselves. We got some final samples in today that we couldn't resist sharing with you. Please forgive the poor evening photography but here goes! 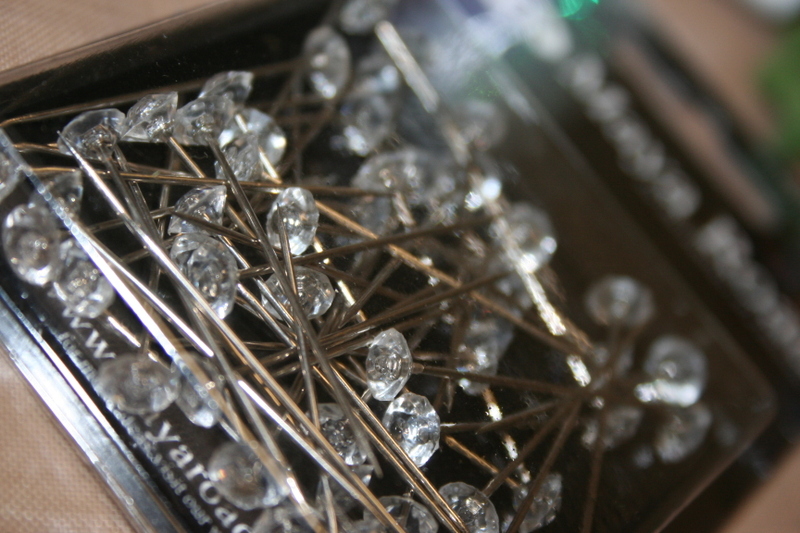 So our jewel topped pins - how does this cute packet of 50 pins for $3.50 sound? They are really pretty and sparkle in the light! 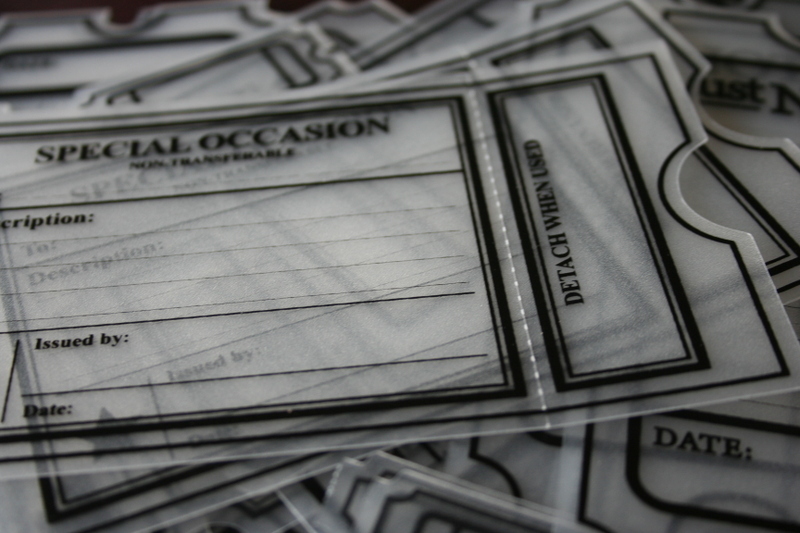 And we haven't shared any die cut sheer sheets yet! Pretty cool huh - just think you can use the Maya Mists on this for a super cool effect on the paper underneath! 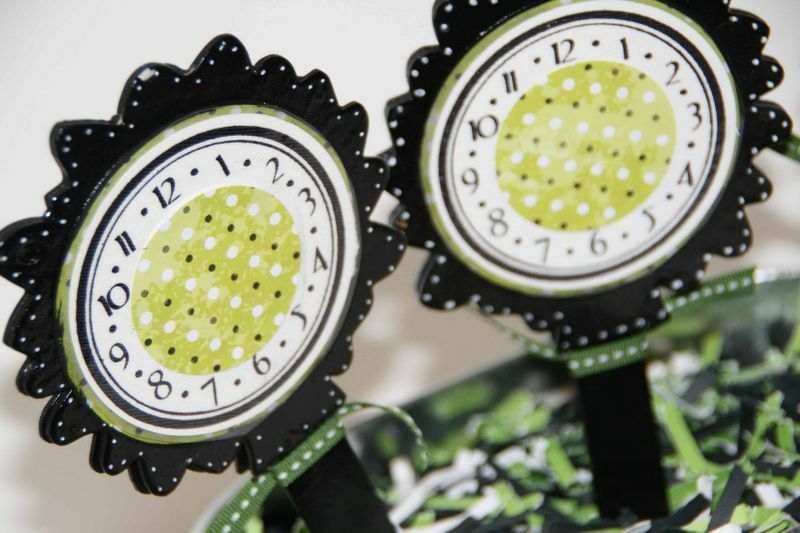 And finally one more product peek - this was one that we had to take our engineering brains to get right - how about an acrylic calendar stand with chipboard pages?? 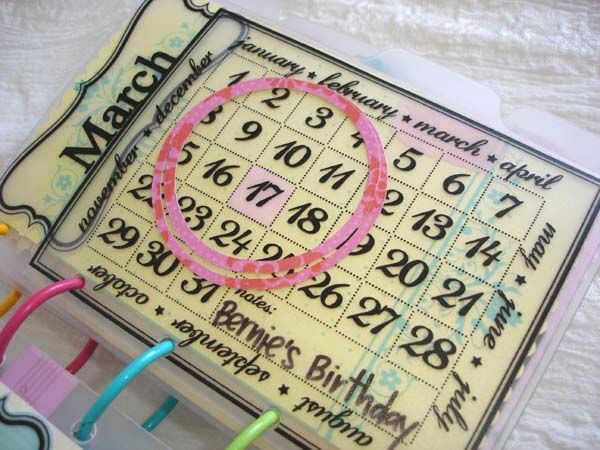 The stand (this one still has a protective cover on it) is made with a thick 3mm acrylic (so think thicker than our acrylic books) and comes complete with the rings and the chipboard pages to make a calendar - HOW COOL IS THAT? And there was a couple of questions we wanted to answer about the mists so here is a list which hopefully sums up all the questions. 1. The mists will come in 8 base colors and 3 metallics (gold, copper and silver). 2. The mists come in 2 oz bottles. 3. Our mists are versitile in that you can layer a metallic under a base color to get a cool effect or if you just want a plain base color, you have that option too! 4. 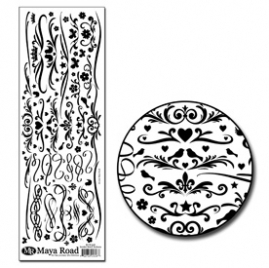 Cost - the Maya mists are $7.00 for a base color bottle and $8.00 for the metallics. 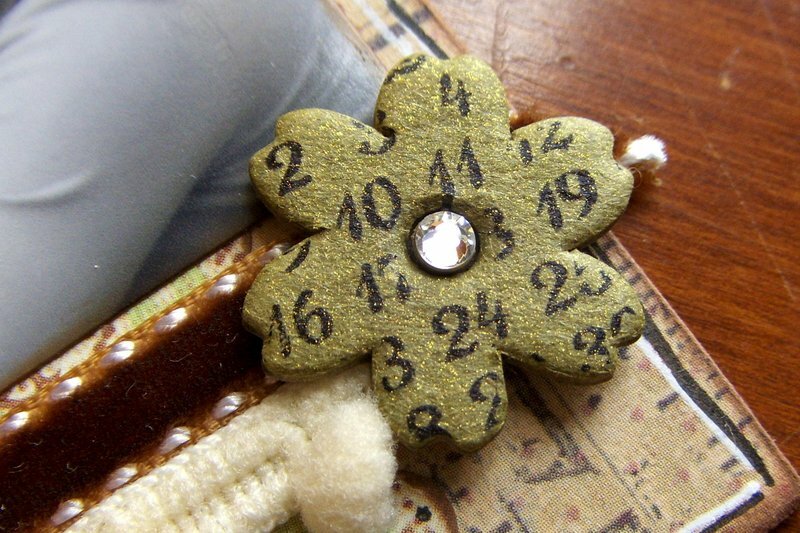 Here is a photo of a flower which was inked with distress ink and then then stamped ith our new oval calendar stamp to get the numbers and then the gold metallic mist applied on top. Ok now onward for more DT inspiration! There was also a question about personal blogs for our DT, we don't have that listed but we will check on that for you after CHA. In the meantime, make sure you always check the DT blog for projects by the different DT members! What if we start with some classic MR and new MR product? 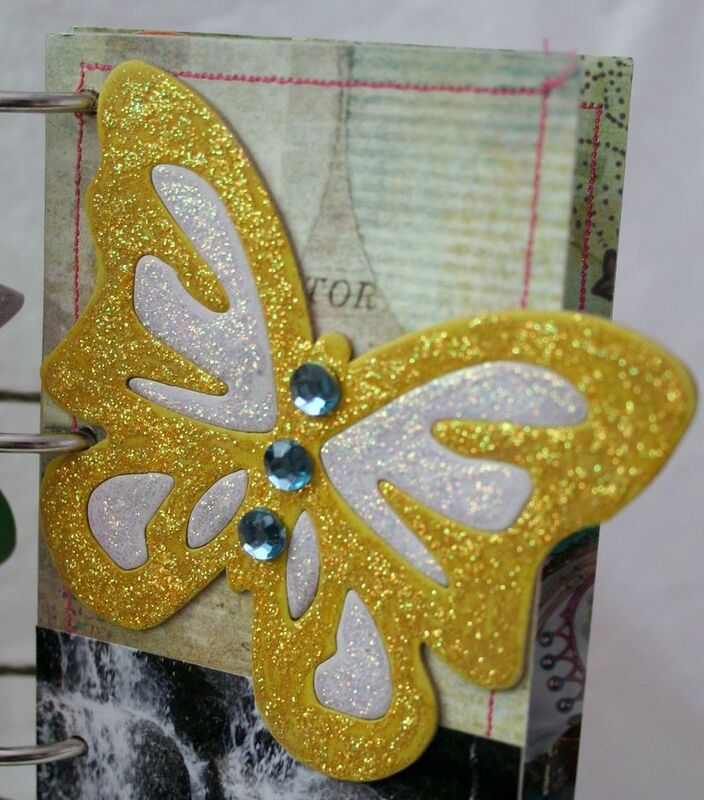 Check out this sweek album using our chipboard butterfly album, some scroll corners chipboard and some new borders chipboard for the body. Another one of our chipboard sheets features full 12" borders that you can alter for a layout easily - or cut it up and use like it is done here for the body! Next we how about a peek at one of our new binders - this is the scroll frame shaped binder - isn't it pretty? Next, what about a new way to use our bungelow house? Is this not crazy innovative? 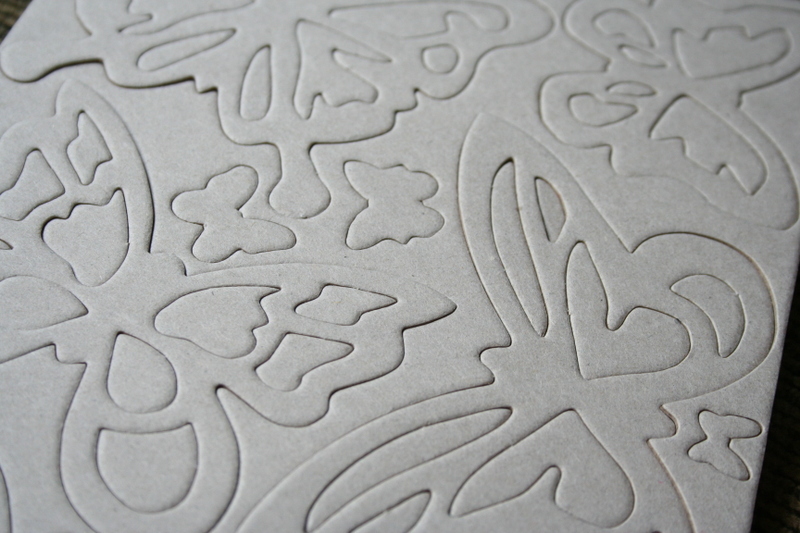 And here is another take on our butterfly chipboard sheet beauties. 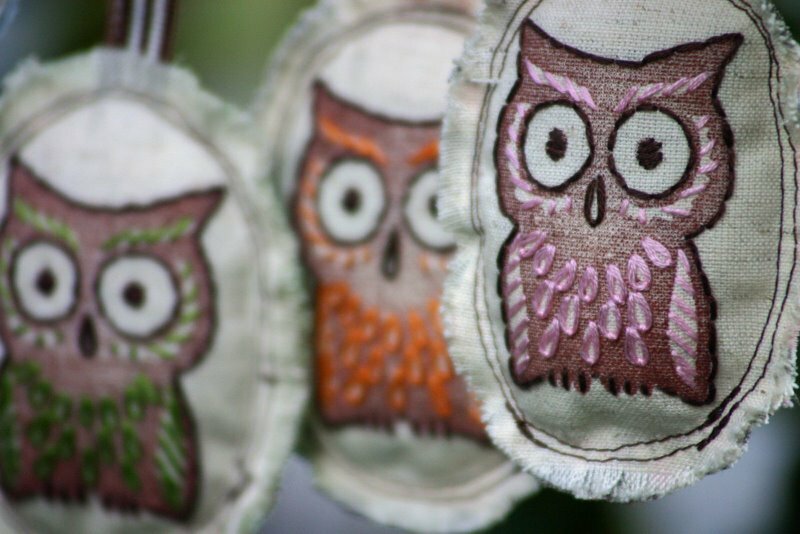 And while we love new stuff, we still love our classics - check out the owl stamp in action here after being stamped onto fabric and embroidered - what a hoot! And how about a close up and full shot of our clear acrylic square accordion project we featured a couple of days ago? 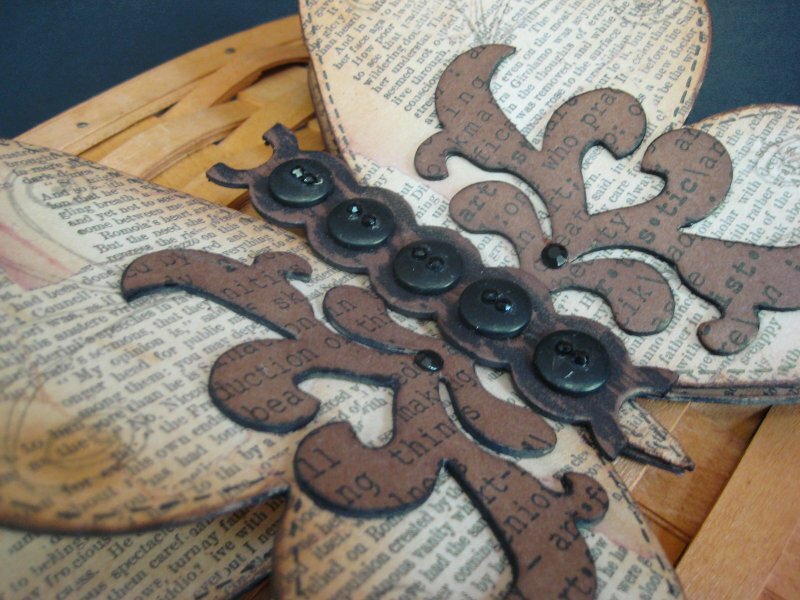 And what about a crazy innovative way to use our chipboards and stamps? These are plant sticks made by placing some of our new chipboard coasters on popcicle sticks, then the clocks were stamped and heat laminated so that the times to water the plants can be written on there with a dry erase marker! 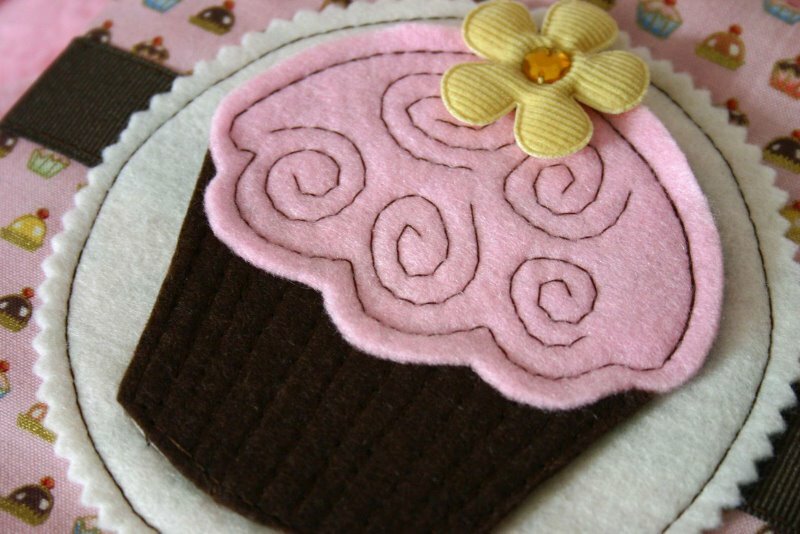 And what about this using our cupcake chipboards as a pattern for the felt cut on the front of an album then sewing the felt around the cupcake? Totally SWEET! And with that, we want to say thank you to everyone who has stopped by these last 9 days to check out what we will be offering at CHA-S. All of these beautiful projects along with the products and the MR gang are headed up to Chicago! Our one final surprise is that we will post a link to the full catalog here tomorrow! Make sure you post today for one more chance at a prize packet. The winners of the 9 prize packs will be chosen on or around July 23rd and contacted and they will be posted here too! So check back. Continue to read our newsletters and check out our website for more ideas, tips and such. Thank you for taking the time to spend it with us these last 9 days! We have lots of plans this coming fall which we will share with you once all our plans are in place. We wouldn't be able to do this without you! Sneak Peek Week - Day 8 - Please Thanks Our Talented DT! And A Surprise too! So we want to thank everyone who has stopped by our company blog so far. We can say that a lot of the MR family has read all the comments and as promised, we will try to continue to address questions we saw from the day before. There were also some questions emailed to us which we want to share here too! 1. Why was my comment marked as spam; why couldn't I leave a comment on a day's post? The "spam" was marked by the program (typepad) we use. We have gone back and allowed comments to be published that the program thought was spam but was not. For the comments, please remember, that each day we stop comments about the time we post the next peek as we mentioned here. So make sure you aren't trying to comment on a prior day's closed post! 2. Will your products be at my LSS? You will need to check with your LSS on this. If there is something of ours you want to see at your LSS, make sure you give them that feedback! 3. Concerning the Maya Mists, the reference to the "proper spraying technique" - this isn't going to be a product that requires a rocket science is it? Now, if you spray from too far away (say 12") - you end up missing a lot of the target of your item (although after trying this out, the effect is cool) - but if you are looking for good coverage this isn't it (again 3 sprays, 12" away). Now, if you spray about 6" (again 3 times) this is what you will get. And if you want to see what they all look like side by side, check this out . And some other general tips related to the spraying techniques. Make sure you wipe the nozzle if you notice there is some mist on there b/c that will affect the spray. You won't be able to hold the mist bottle upside down to spray as the inlet for the liquid is at the bottom of the bottle. Also, if you have your item held straight up and down (meaning perpendicular to the ground), the chances of coverage being not good is higher since gravity is working against you and the droplets will start to pool and head downward. Also give the mist a bit of time to absorb and dry between sprays. Ok, now it is time for our DT inspiration. Before we start, we wanted to recognize our Design Team for all their hard work in getting us all these beautiful samples together. Check them all out here and please make sure you thank them in your comments for all their inspiration. 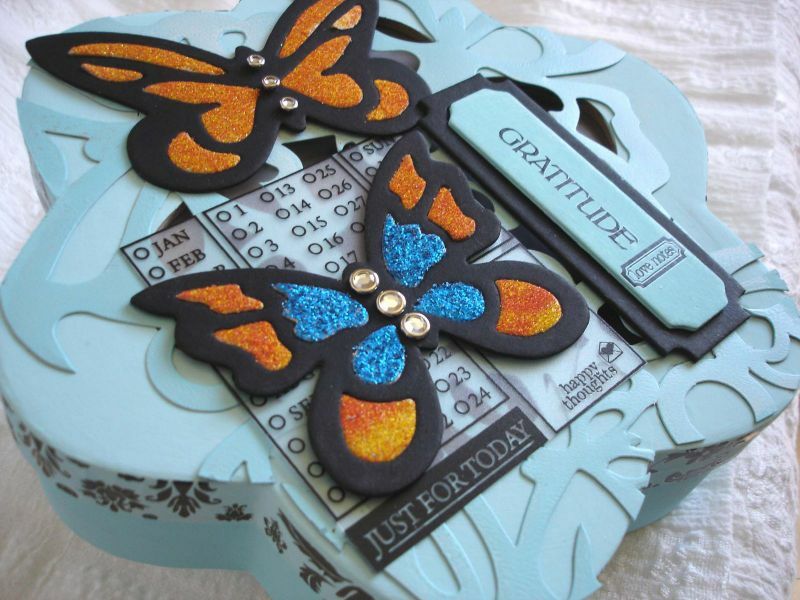 And what about this gorgeous stitched cupcake using our stamps as the pattern - pretty cool huh? 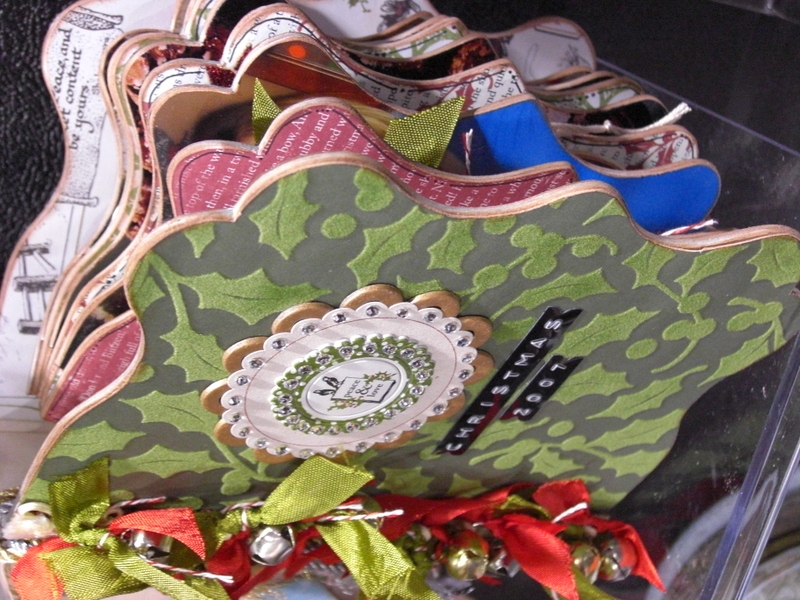 And what about this beautiful new scallop binder (yes, that is right a cool scallop binder)? 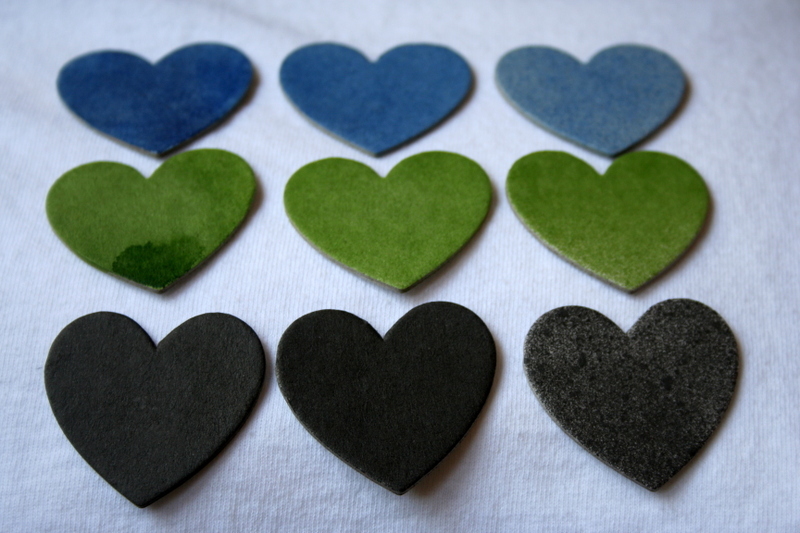 And check out one of our new bulk coasters. 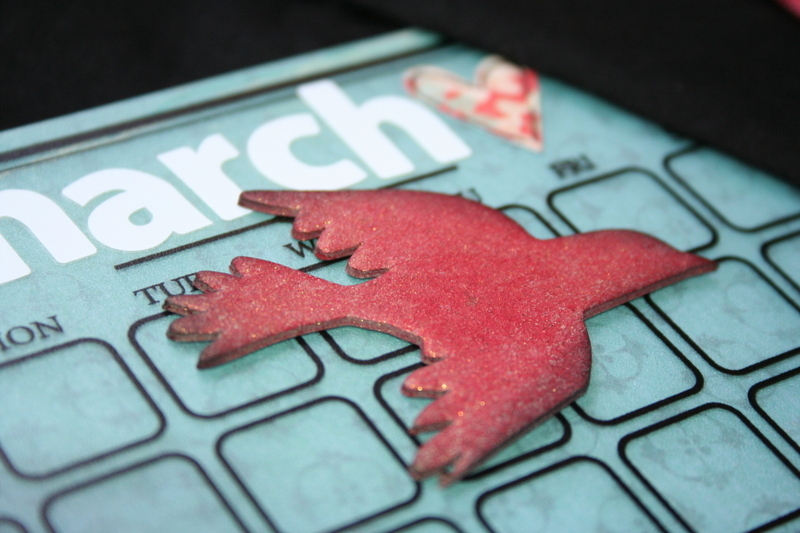 And check out our new cherry blossom bird on our sheer calendar album. And since we have so many fabulous projects, we are going to post more DT inspiration tomorrow and yes 1 more chance to win some new MR goodies! Remember to post a comment today for a chance to win a prize packet featuring some of our new MR products! Day 6, we hope you have stuck with us! And we wanted you to know we do read each and every comment. There were a couple of questions in the last day's post we wanted to talk about - someone asked if they rubon used in this photo was new. Actually is it one we have already here - our border scrolls - one of very popular set of rubons! But related to rubons, yes we have more but we will have to share that another day(perhaps a day 9 peek - LOL)! And there was a comment from someone that said they liked what they saw day 1-3 better than the other days; hey it's all good. We here have our personal faves too; we make a lot of different things based on a lot of our different interests so that everyone has something they can love! Back to our peek for today. So we are onto the clear part of our release. Can you believe that we are going to make clear albums? Yes you heard me right clear albums. 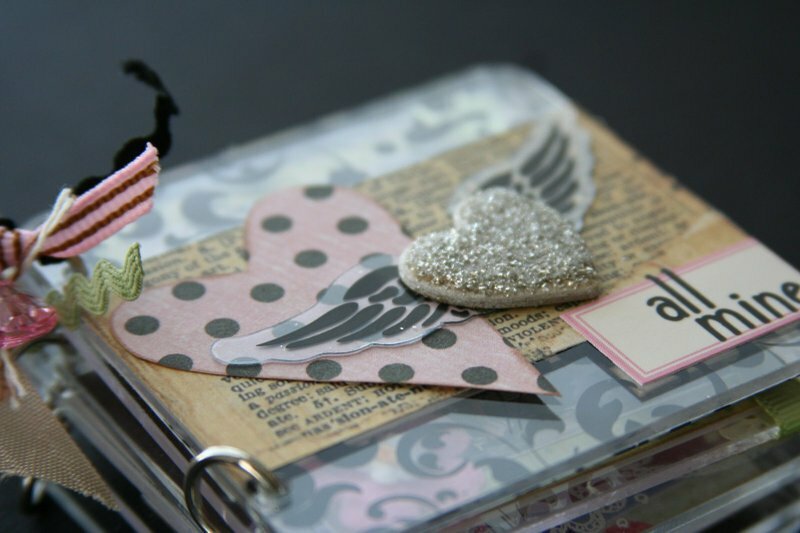 Let me start you off with some inspiration - here is our 3" x 3" square accordion album. We decided to make our acrylic albums out of a thick 2 mm acrylic (and therefore it is not flexible nor can you take a hole punch to it but hey if you want to do that, you can use one of our sheer albums instead). 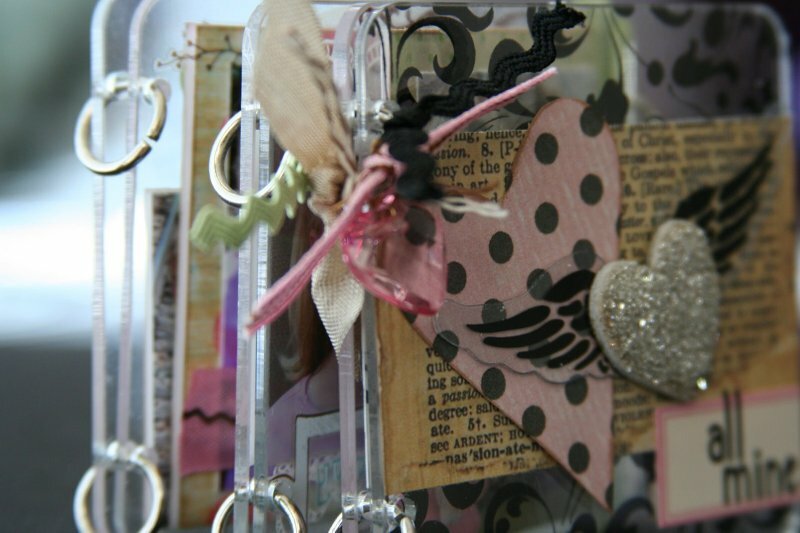 The albums come complete with the jump rings, binder rings or chains. 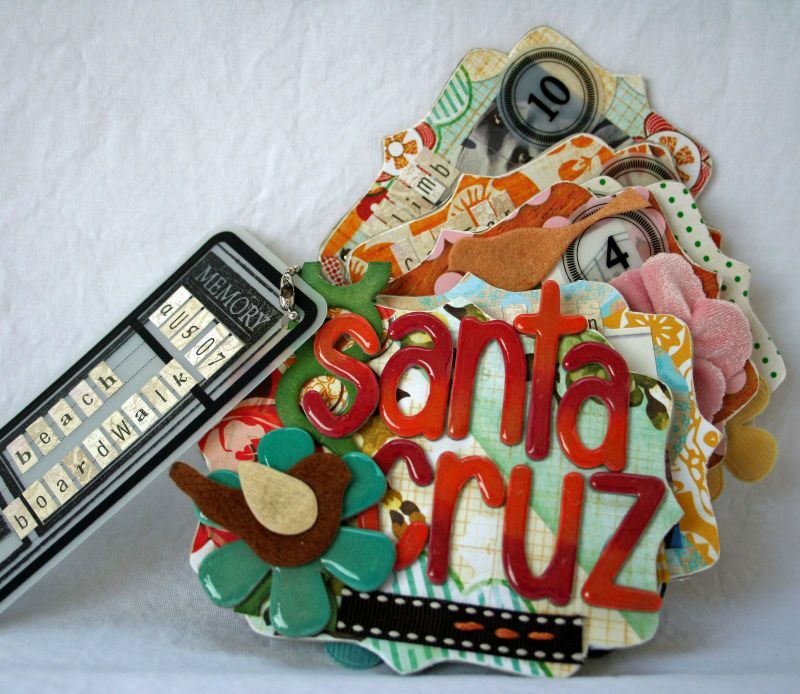 Each of our albums / books corresponds to a chipboard album with the same name - just think of the possibilities! And the best of all? The price! This 3" x 3" acrylic album will run less than $5.50 retail in the US! 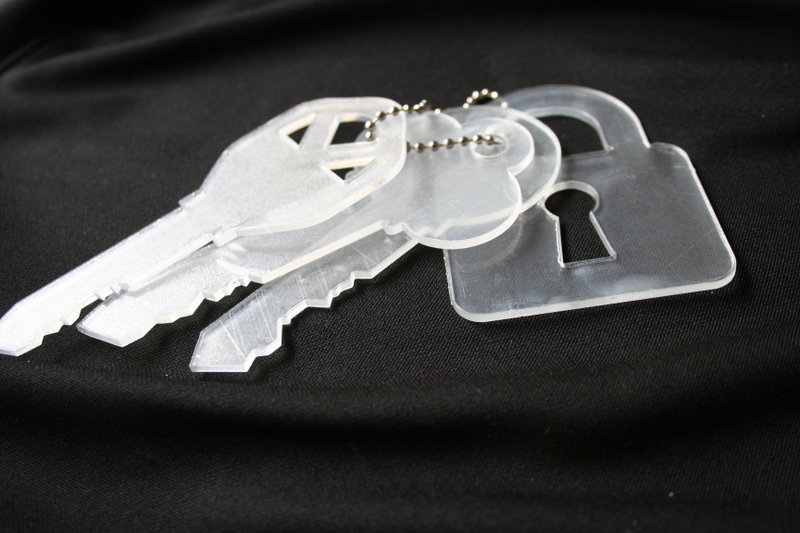 Our entire acrylic line top to bottom will retail from $3.00 to about $12.00! How cool is that? Let me not stop there with some inspiration. 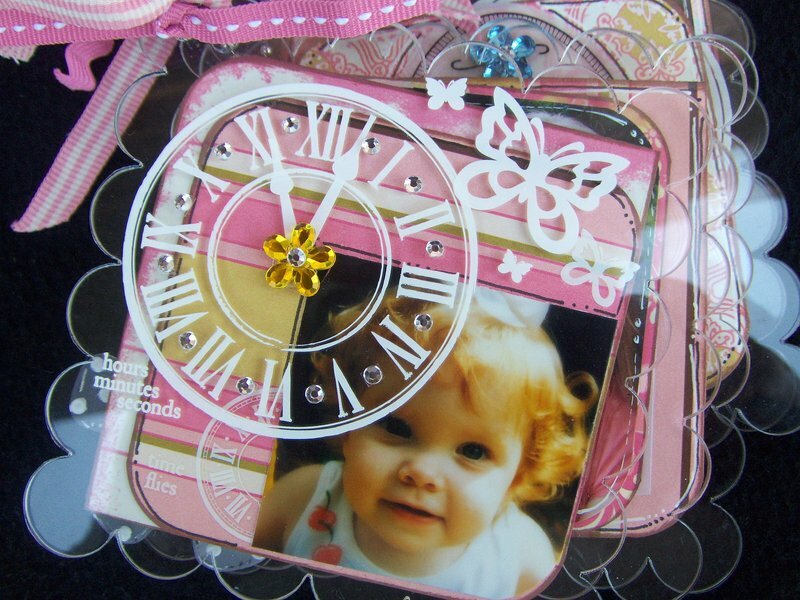 Here is a photo of our beautiful square scallop coaster album. This little beauty is will retail for less than $6.50 - this is a 4" square acrylic square coaster album with 6 total pages. 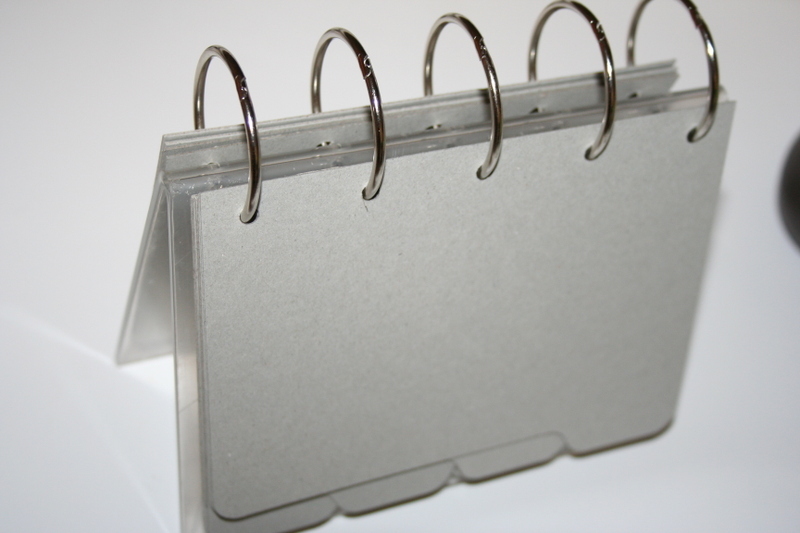 We have a total of 11 clear acrylic items coming out - here is a peek at another one of them - our scallop accordion album. But we aren't done yet. You know what else clearly goes with all these items? 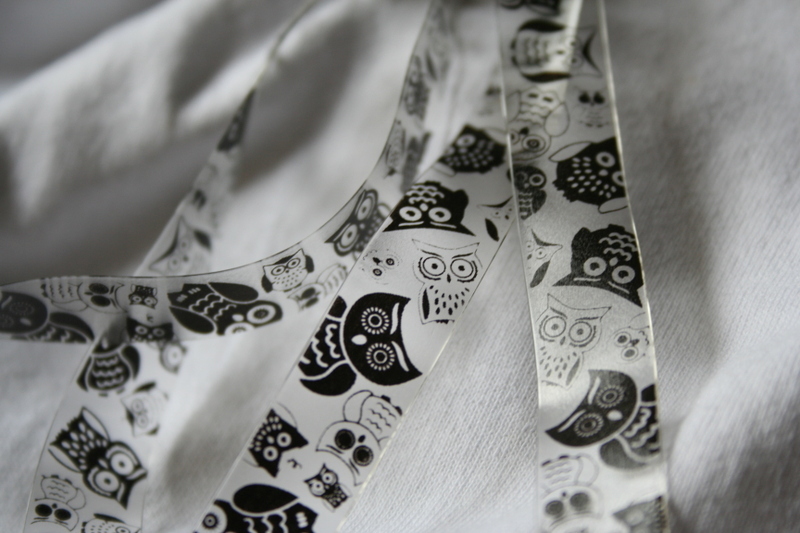 Some of our beautiful sheer ribbons! We will have 12 in all. Here is a peek at one of the colored ones. And what about something cute in black? 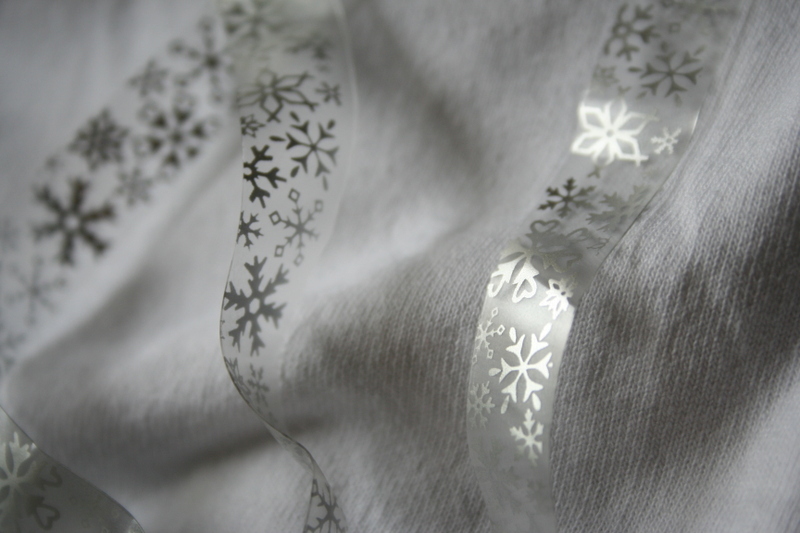 And finally, we decided to step out and try something with our sheer ribbon that is totally different - how do you feel about snowflakes in silver? Seriously, our hearts skipped a beat when we saw these beauties! And remember you have 24 hours to post here for a chance to win one of our prize packages! 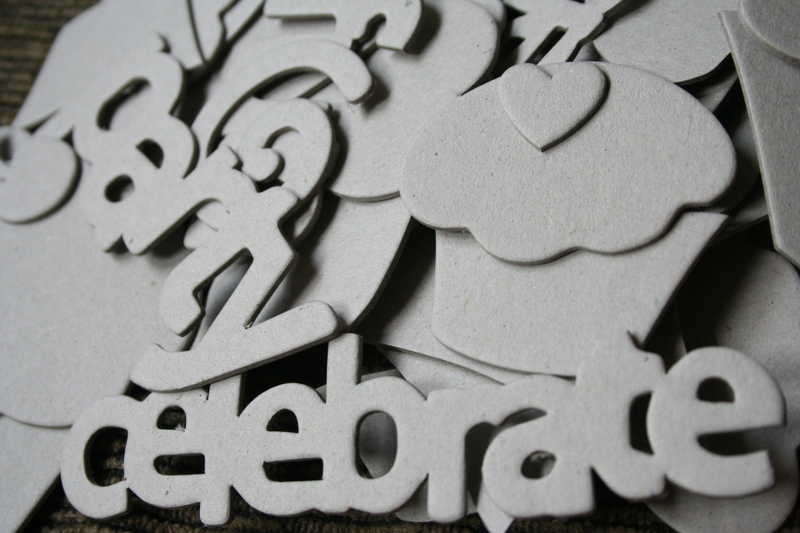 We hope you have enjoyed the diversity of our peeks so far, today we wanted to share with you some more chipboards - except this time not albums but our chipboard shapes. Are you ready? 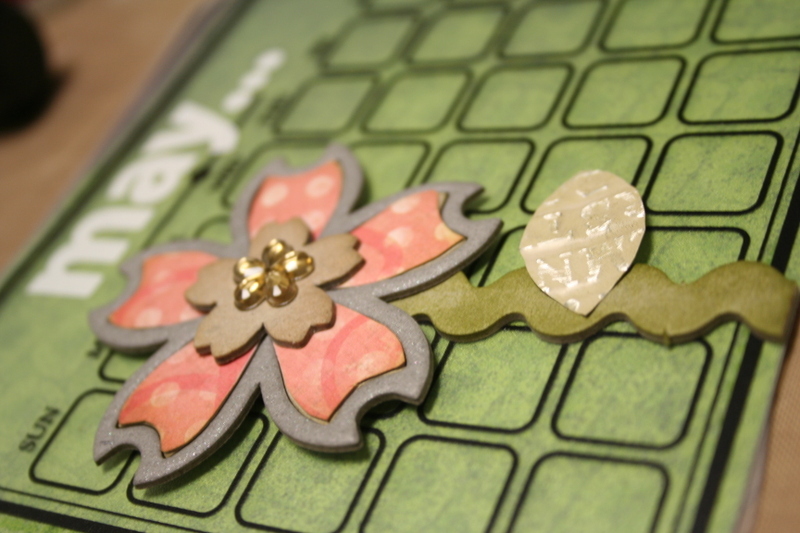 We had talked yesterday about our Cherry Blossoms chipboard set which have a definite Asian flair to them. Here is what the set looks like. 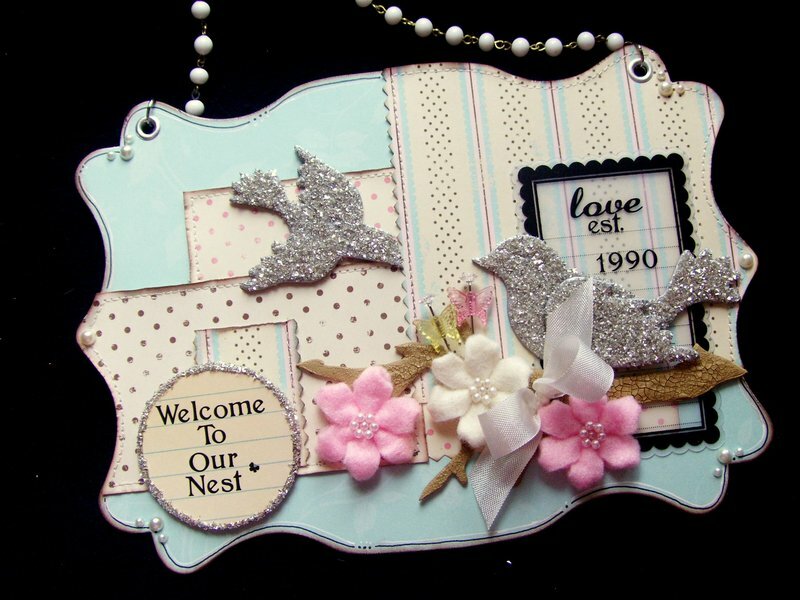 We love the look of these birds along with the cherry blossom flowers and branches - there are over 50 pieces in this set! And here is a large view of the project we featured yesterday using this set of chipboards. Do you see how beautiful the birds look with a sprinkle of glitter and how the branch pops with some crackle paint? 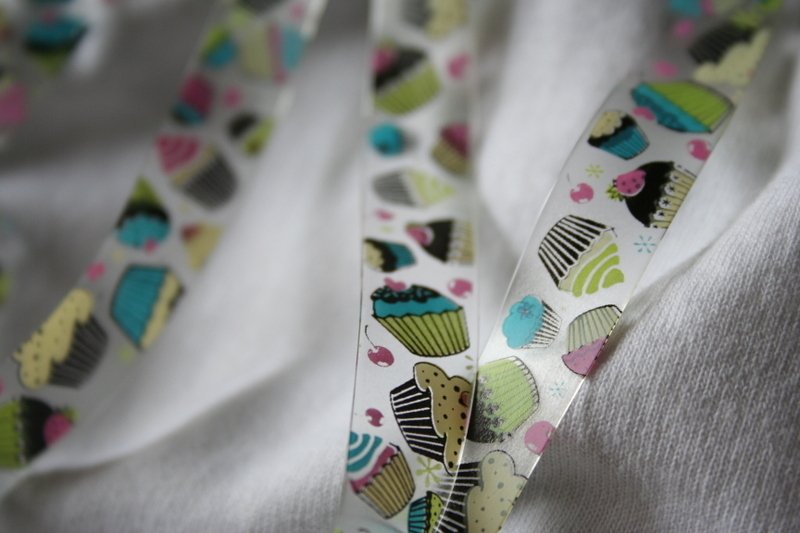 We also noticed that you seemed to LOVE the cupcake set of stamps from yesterday. 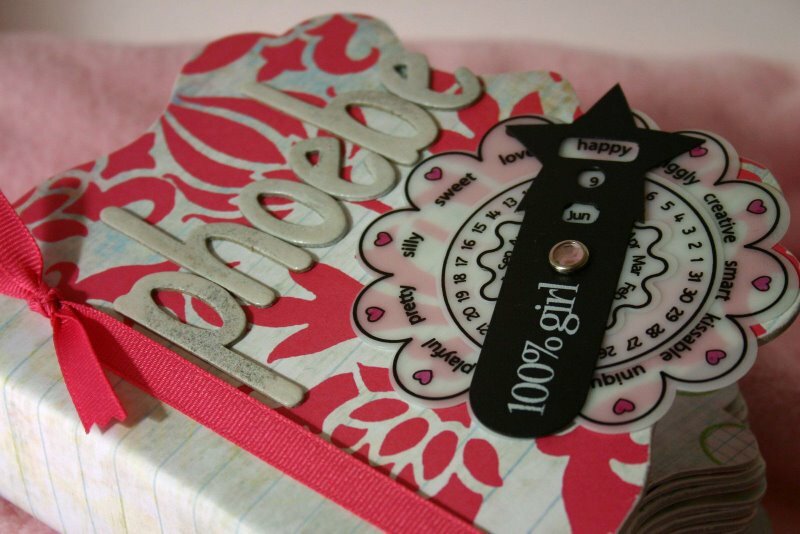 If you are excited about that, check out this cupcake set of chipboards. 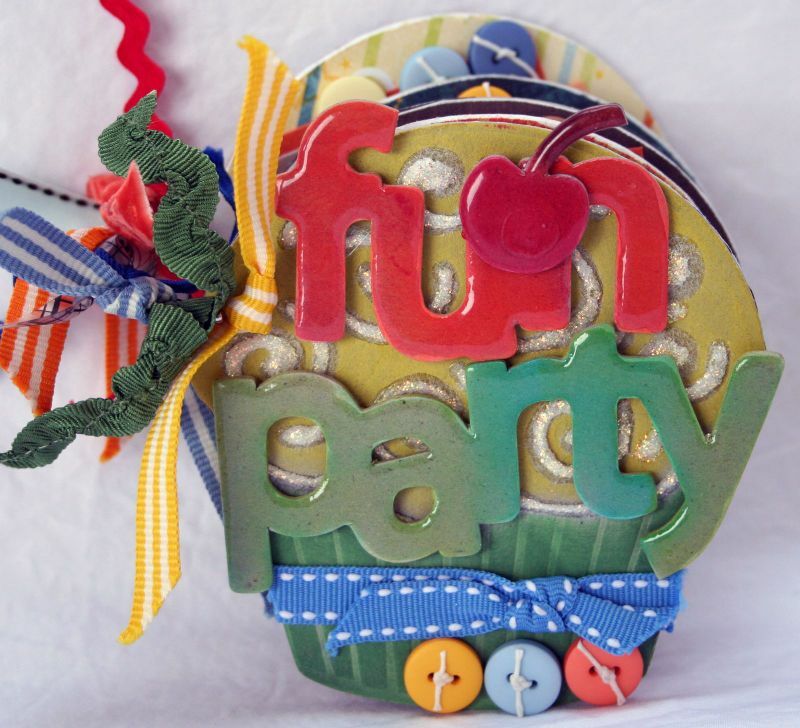 There are over 50 pieces in this set including the words- party, celebrate and fun. There are cupcakes of all shapes and sizes here. And it wouldn't be a party without some party hats too! Just think all the sweet goodness with none of the calories! Here is what our design team did with the set. 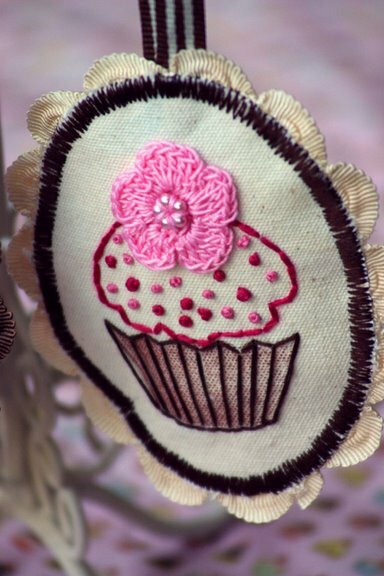 Oh yeah, did you notice this was done on a small cupcake coaster which has an embossed cover? How is that for a bonus peek - this embossed cover coaster cupcake is about 3.5" wide will retail for about $2.25 in the US. Both of the chipboard sets (the Cherry Blossoms and Cupcakes) come in our signature lunch tins and will retail for about $8.00 in the US. But we are NOT DONE WITH THE PEEKS! 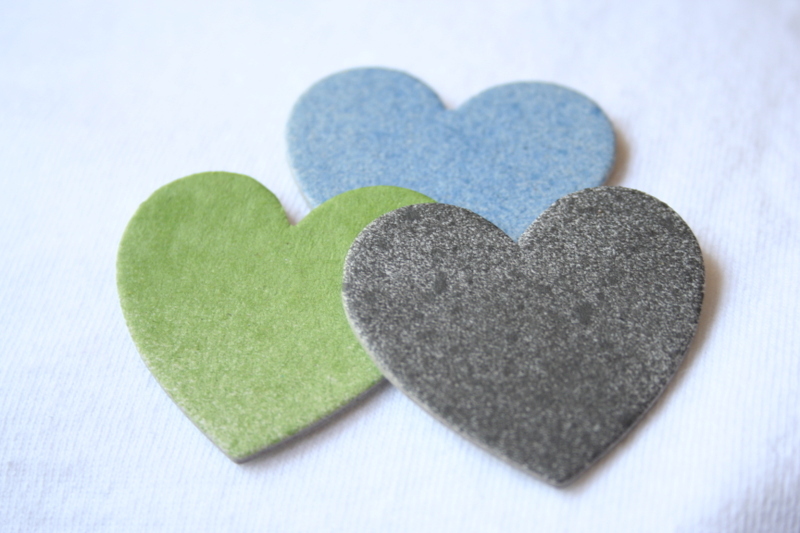 We are doing some new things now - how about some chipboard sheets? And what about some butterflies? 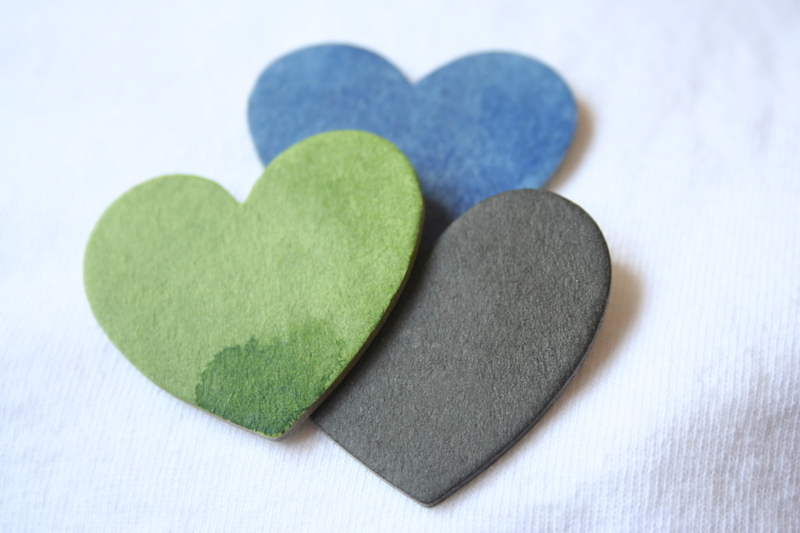 We are releasing 4 different chipboard sheets - that are 6" x 12". 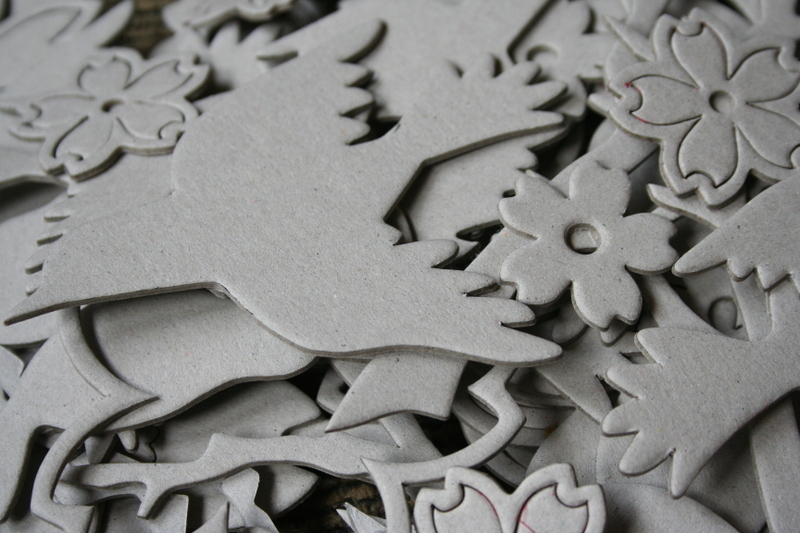 The chipboard sheets are made from the same high quality chipboard as the ones in our tins but in sheet form. The 6" x 12" sheets will retail for about $3.60. Check out how AMAZING the butterflies look all done up. 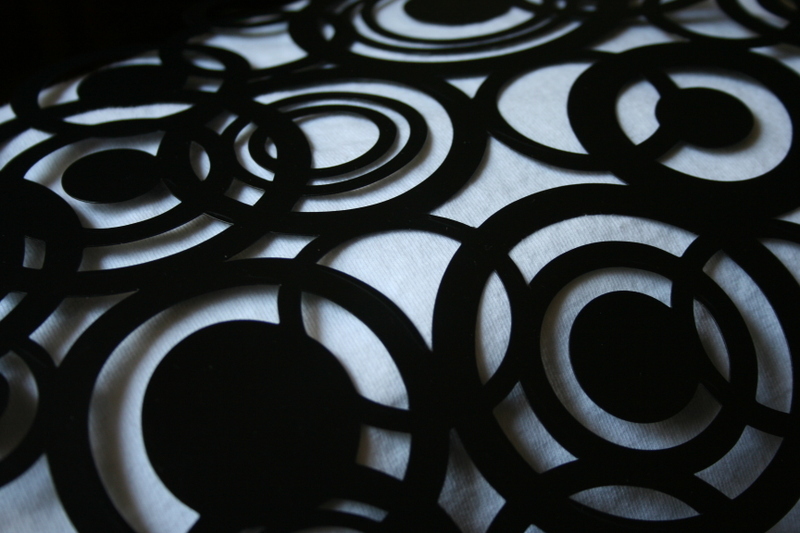 And here is a tip, save the sheet that the chipboards come on and use them as a stencil/mask for other projects. And finally, there was a question about bling from one of the comments, and yes, we are taking the bling plunge! 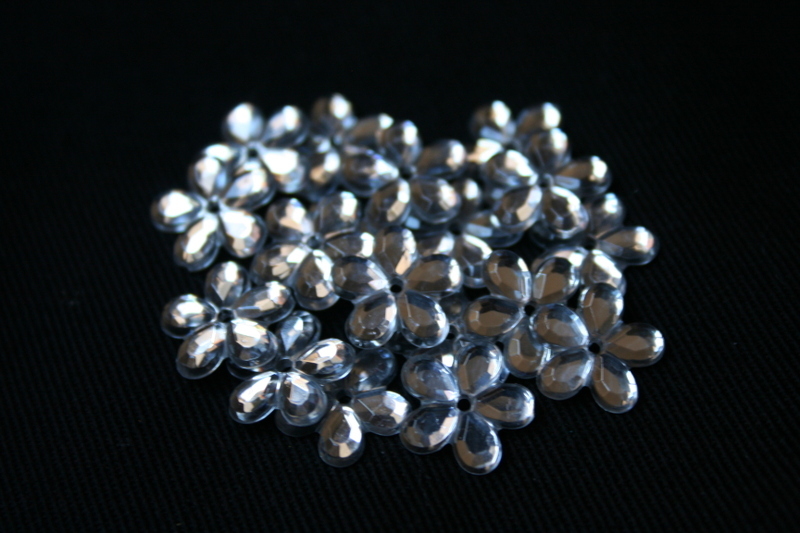 We will be offering 3 different sets of flower jewels in clear, spring and winter color schemes. 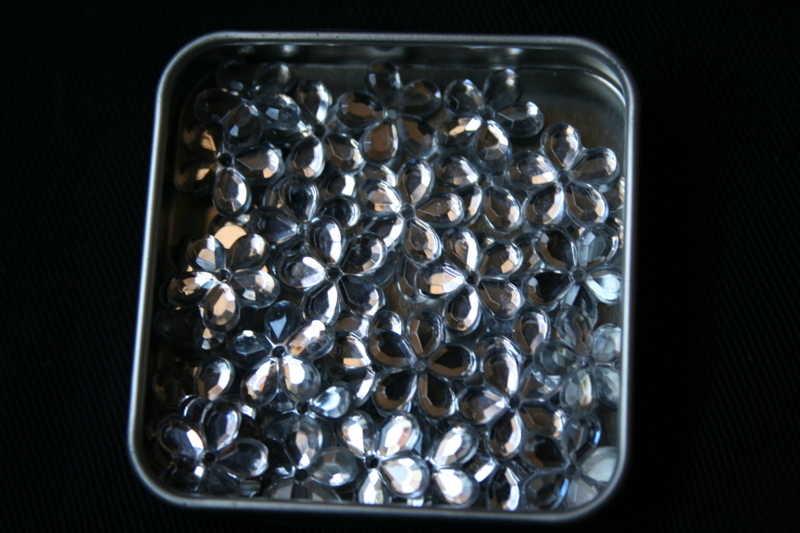 There are 40 jewels in a signature MR journey tin (the photo shows the cover off the tin) and this all retails for $3.00! Check out these pretty flowers in action. Whew, we made it through another day of peeks. Let us know what you think for a chance at a prize pack! And finally, we were thinking that on day 8 (Monday), we would share some projects from the Maya Road DT so you all could be inspired AND we would throw in 1 extra prize pack up for grabs! What do you think? Let us know! Sneak Peek Week - Day 2 - how about a TICKET to ride? We hope you have been enjoying the sneak peeks thus far, are you ready for day 2? Remember, each day is a new chance to post a comment for a chance to win one of the 7 Maya Road prize packages. For more information, check out the details here. Onward to the peek! We have to say that our printed sheers have been one of our best sellers in the last year so check out what we are adding to the collection. Introducing the addition of some Maya Road Ticket Printed Sheers! These sheers come 40 total packaged in one of our signature Maya Road tins! At a retail price of $8 - just think these awesome tickets cost only $0.20 a piece! Here is a project idea from our talented Design Team. 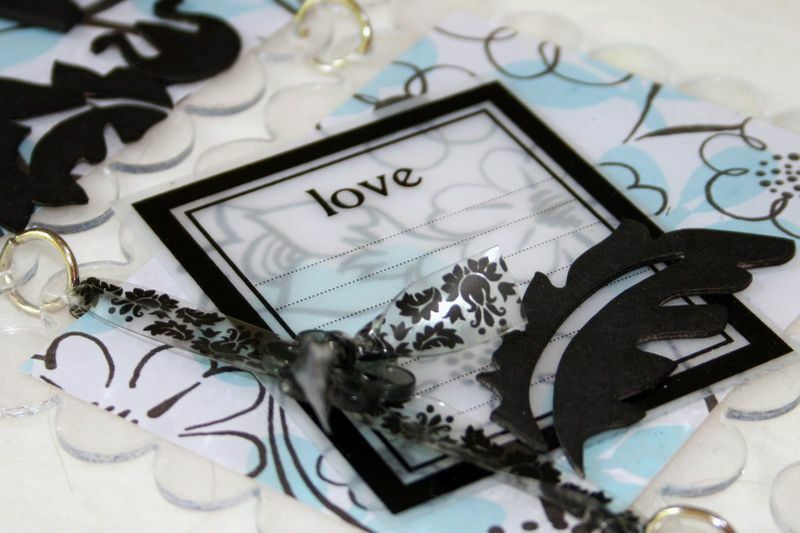 Check out how they used it with some other printed sheers and also one of our sheer albums. Now for our second set of printed sheers, we couldn't get to the end of the year without A Day To Remember Set of printed sheers, so here they are. These awesome sheers will come 36 to a set again packaged in our signature Maya Road tins - they will retail for about $8.00 in the US! Check out this product in action in this beautiful project. Just remember you can journal on these sheers with any permanent ink pen, rubons or even stamps! 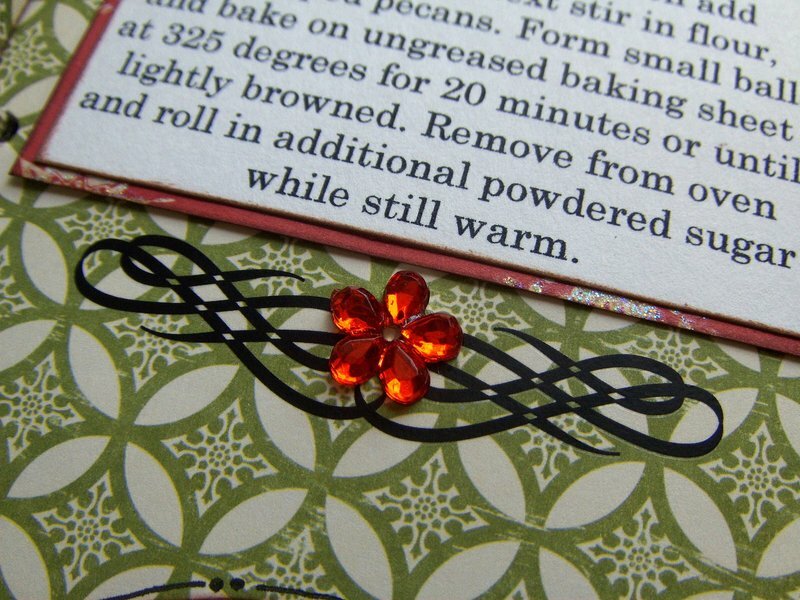 And finally, we have a bonus sheer sneak peek! 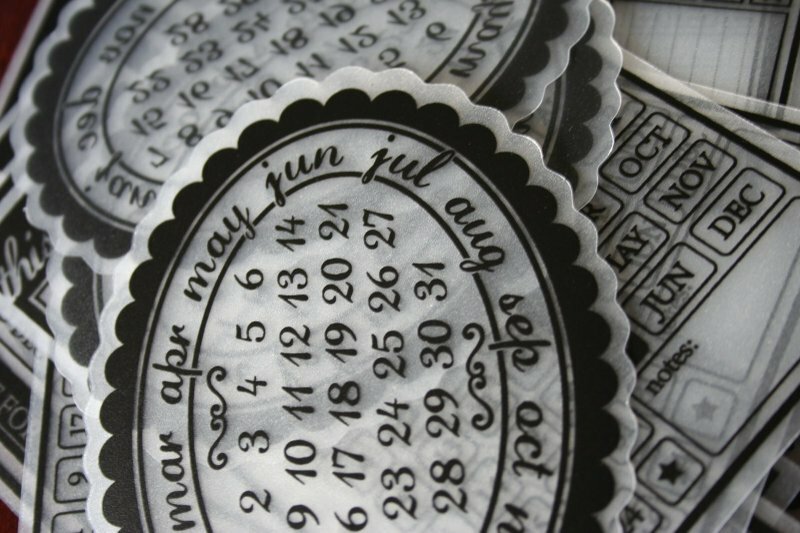 We created a beautiful printed Calendar Sheer Album which comes complete with 12 sheer blank calendar pages on a ring. These albums will be sold individually at your local scrapbook stores and are limited edition. 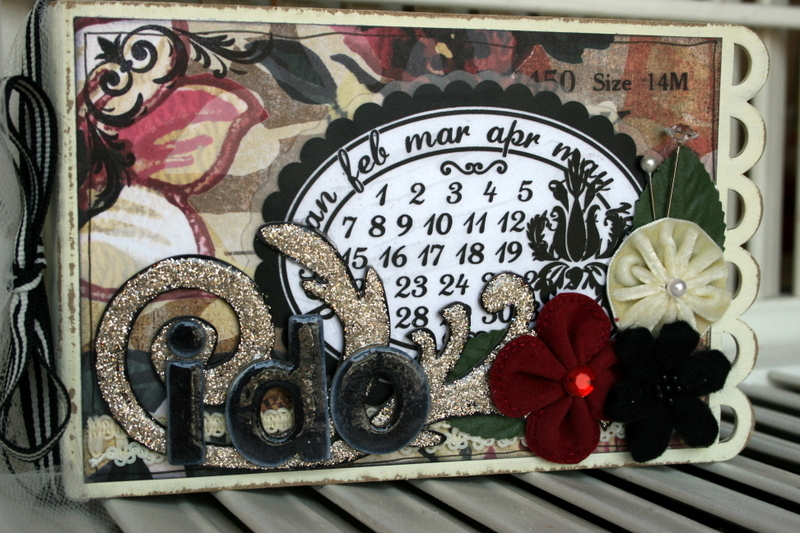 Here is a sample of what the printed Calendar Sheer Album looks like decorated up. Also - this calendar has a bonus set of other sneaks on there - can you see all of them?? Enjoy and check back tomorrow for some more exciting peeks! Maya Road's SNEAK PEEK WEEK begins Monday! It is hard to believe that CHA-S begins for us in less than 2 weeks! With that, we decide to start Maya Road SNEAK PEEK WEEK! Each day we will be revealing some items from different categories of products we will be showing at the show! Along with some peeks at the product, our talented design team will be providing you all with juicy bits of inspiration. 1. 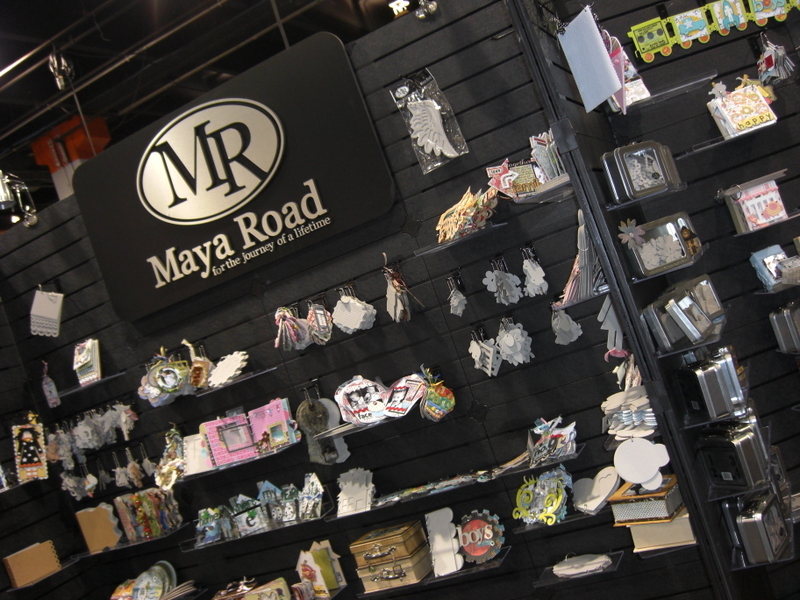 Come to this blog - the official Maya Road company blog and check each day to see what what our peeks are. 2. Leave a comment on this Maya Road Company Blog- each day you have 1 chance to leave one comment on that day's peek. We will close the comment section when we publish the following day's peeks. 3. We will pick 7 winners for the 7 days of peeks. The winners will be announced AFTER CHA-S (around July 23rd) so make sure you check back! 4. Each of the winners will recieve a prize package assortment of products from the Maya Road CHA-S release!